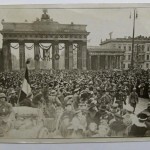 Beschreibung/Description: Historisch bedeutsames Foto aus den Revolutionstagen im November 1918 in Berlin. Stammt aus dem Nachlaß des Fotografen (Serie von Revolutionsfotos). 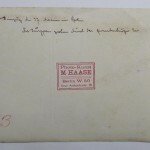 Beschriftet mit: “Einzug der 37. Division in Berlin. Die Truppen ziehen durch das Brandenburger Tor”. Mit Stempel. Historically significant photo from the days of the revolution in November 1918 in Berlin. Comes from the estate of the photographer (series of Revolution photos). Labeled with: “Catchment of the 37th Division. Troops move into Berlin through the Brandenburg Gate”. With stamp. Fine condition.